Apple fans apparently make up a majority among the US House of Representatives, a survey conducted by NBC’s Meet The Press shows. 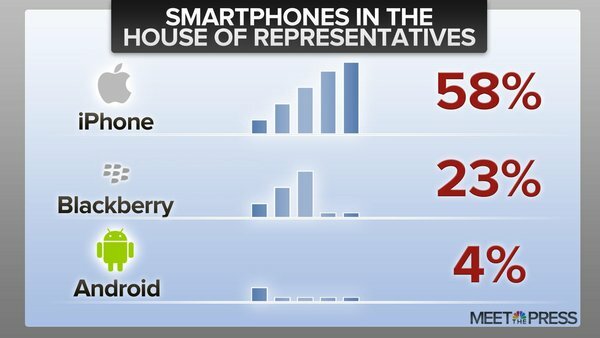 In total, 58 percent of the House uses an iPhone — more than twice as much as the 23 percent using a BlackBerry device — while Android phones rank last, with only a mere 4 percent of the House members saying they use one. For a breakdown between parties, 61 percent of Republicans in the House use an iPhone, while 56 percent of Democrats do so. The survey was carried out over a two-week period in September via calls and emails to every Congressional office, with responses received from 88 percent of the House members. Out of the House, 51 members (or 12 percent) declined to take part in the survey or chose not to respond.